Amazon Price: $1,049.00 $947.00 You save: $102.00 (10%). (as of April 24, 2018 2:36 am - Details). Product prices and availability are accurate as of the date/time indicated and are subject to change. Any price and availability information displayed on the Amazon site at the time of purchase will apply to the purchase of this product. 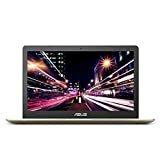 ASUS VivoBook M580VD-EB76 15.6" FHD Thin and also Light Gaming/Multimedia Laptop; 7th Gen Intel Core i7-7700HQ Processor 2.8 GHz (Turbo approximately 3.8); Discrete GeForce GTX 1050 4GB graphics; 16GB DDR4 RAM; 256GB SATA3 M. 2 SSD + 1TB HDD; Illuminated Chicklet key-board; Harman/Kardon sound; Gold & Metal Finish; Windows 10 Home (64-bit); 1920 x 1080 LED Back-lit, anti-glare screen; Dual Band 802.11 air conditioning Wi-Fi; Bluetooth 4.2; 1x USB 3.1 Type C (gen1); 1x USB 3.0; 2x USB 2.0; 1x Headphone-out & Audio-in Combo Jack; 1x HDMI1.4; SDXC Card Reader; TPM Security.